Limbik Theatre’s adaptation of George Saunders’ short story, The Semplica Girl Diaries, has a nightmarish premise. Set in a near future, the super-rich employ women as living garden ornaments, placed in huge dress-harnesses and physically connected via a surgically-implanted microline through their foreheads. The women are almost all immigrants, fleeing poverty and political turmoil, supporting their families at home. It’s a last-resort job – uncomfortable, terminally boring and degrading. While the short story is told from the perspective of the employers, Limbik Theatre focuses solely on the women, giving voice to the oppressed. Though this lends it a stronger sense of political import, I did miss some of the story’s satirical edge which comes from the employer’s voice, obviously blind to the cruelty it is enacting and confused as to why the women would want to escape. 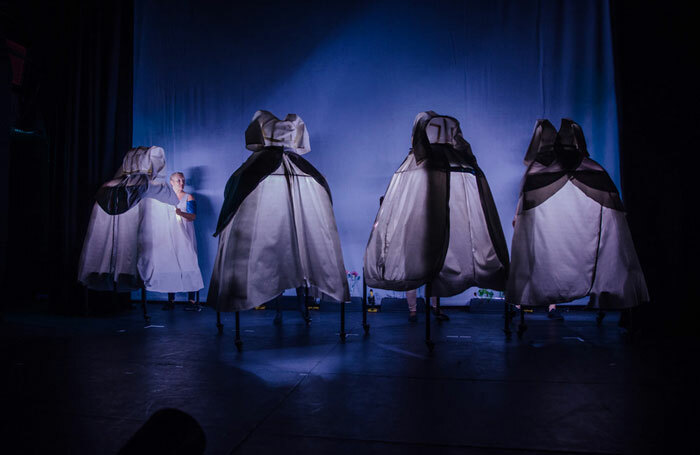 Ben Samuels’ production is certainly visually arresting, with the four dresses standing some eight feet tall, the actors trapped inside them Beckett-style. But for a short story adaptation, it’s surprisingly flabby and runs for 75 minutes. Some of the physical work is a little sloppy and it needs a little time to bed in and tighten up.